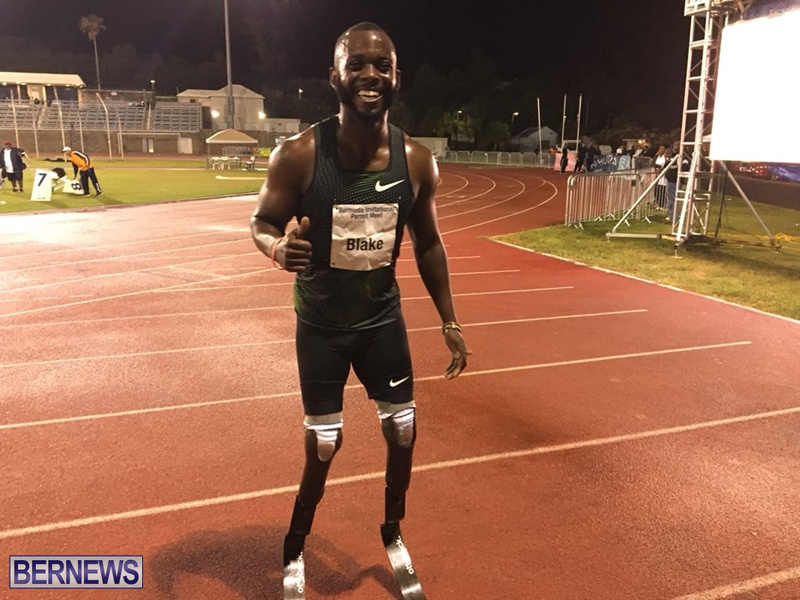 Those were the words of American track star Blake Leeper after he raced to victory at last night’s Bermuda Invitational Area Permit Meet at the National Sports Centre. Mr Leeper, who was born with both legs missing below the knee and has been using prosthetics since he was a child, was the only differently-abled athlete in the race and put on a commanding performance to claim the win. He finished in 45.21 just beating Brycen Spratling who was second in 45.22, while Mike Berry was third in a time of 46.11, giving the Americans a clean podium sweep. Athletes from the USA, Nigeria and Guyana were also in the race, with Olympic medalist LaShawn Merritt withdrawing before the race due to an injury. As a world record holder with multiple Paralympic and IPC World Championships medals, Mr Leeper has cemented his status as one of the best Paralympic runners in the world, and is now aiming to qualify for the Olympics. Speaking to TrackAlerts after the race, Mr Leeper said, “I’m just excited. The crowd got into it, they pushed me down that last 100 meters, and that’s what track and field is all about. You go out here, you give all you’ve got, give a good performance. “Hopefully I can show the kids; look at my story, born without legs, doctors told me I’d never walk, now I’m out here winning international races. “This is the beginning for me. Hopefully I get a little bit faster and going into 2020, make the Olympic Games, and do what I got to do.